Farming methods had not altered very much for hundreds of years, but towards the end of the nineteenth century, with the advent of steam, and the early part of the twentieth century, with the development of the internal combustion engine, things did begin to change. First the big steam driven traction engines were used for powering such things as threshing machines, and transporting large loads. As the twentieth century moved into its second and third decades, the smaller and more versatile petrol driven tractor began to make its presence felt, although many of the lighter tasks continued to be carried out by hand. Despite this, the use of the land for agriculture had always been governed by a number of factors, and these continued to be as relevant as ever The soil, the aspect, the ownership, the markets and the subsequent adaptability of crops and livestock. 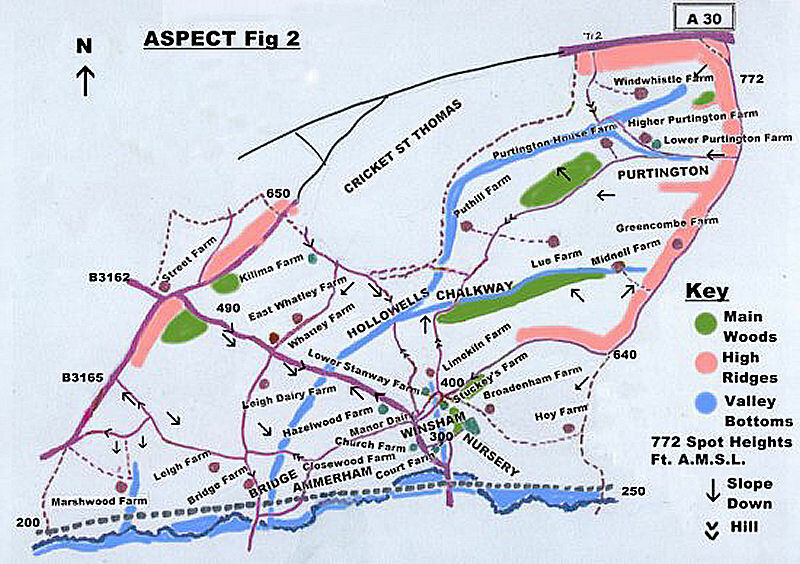 (Click on small maps to enlarge). In this hilly Parish the existing top soils were laid down at the end of the last ice age (10,000 yrs ago). These are the 'clay and flints' overlying the Chalk ( mostly above 600 ft ) , the Upper Greensand (mostly above 400ft) and the Jurassic sands and gravels right down to the Axe River. The soil acidity is usually above neutral (6.7ph). Within this general distribution, even within fields, the top soil varies. For example, in the top four-acre comer of the last field before the Winsham road junction with the A30 main road there was a Gorse dividing-hedge and Bracken grew in profusion along the other hedges, providing signs of acidity (over chalk at depth). Further along that same field, all the stones are rounded like a pebble beach (at 773ft) . Other Parish fields display dark loams, sands or in one case, peat. A soil sample of 14 fields on one farm shortly after the War showed no two exactly alike. Few Winsham fields are flat. 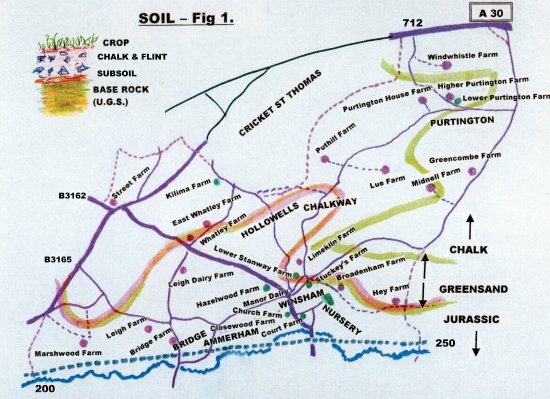 The Rothamsted Experimental Station 'generalised soil map (1974)' denotes the Winsham area soils as 'Palio-argillic Brown Earths and Stagnolley Soils'. The soils of Winsham are rated 'grade 3'. There are some 'Grade 1' Somerset soils to the north said to be 11 ft thick of loam. These grow potatoes and other market garden crops. Winsham is tilted towards the south-west from the Windwhistle Ridge (772ft) down to the River Axe (200ft) and is only 7 miles due North from the sea at Charmouth. This leads to a mild climate. The clay from the chalk (blue and yellow) and the clay (gault) below the greensand (a good aquifer) leads to plenty of spring water. There are also 'sinks' into the base rock. The reputed rainfall grades from of about 37 to 29 inches from top to bottom of the hills. The prevailing wind is S.W. On the older area maps the land North and East of the Winsham Parish boundary is shown a belonging to Lord Paulette (Hinton House) and the corresponding area South and West as that of Lord Bridport (Cricket House). 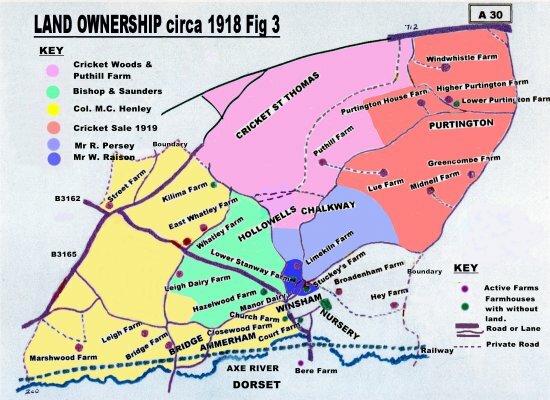 In 1919 Mrs Hall - by then having bought The Cricket Estate from Mr Fry - sold off 827 acres comprising 5 outlying Parish farms, and the 10 houses comprising the hamlet of Purtington. Mr Tom Corr bought Purtington House Farm, Lower Purtington Farm and the whole hamlet. The two Pile brothers each purchased Midnell Farm and Lue Farm. Mr Smith later bought Newhouse (Windwhistle) Farm. Puthill Farm was retained in the Cricket orbit. A 1918 map in the Village shows several other Parish landowners. Manor Farm (Bishop sold to Saunders) is marked in green . To the west and south is Col.. H.C.Henley (centred on Leigh House). A section between is shown as owned by Robert Persey and William Raison ( Stuckeys Fm). Not on this map were Hey Farm (Mr Dommett) and Paull's Ash Fm -later Broadenham- (Mr Budge). This section merits further research. The Map, for the purpose of identification of areas, does contain names of Farms that did not exist in 1918 -for example, Hazel Wood Farm.